Paris St-Germain were crowned French champions for the third consecutive season after a hard-fought away victory over Montpellier. 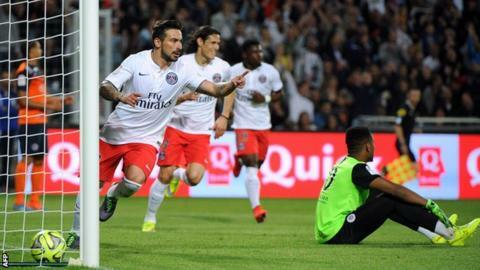 PSG needed only a point to be certain of becoming only the fourth Ligue 1 club to win three consecutive titles. France midfielder Blaise Matuidi and Argentina forward Ezequiel Lavezzi gave the visitors a two-goal cushion. Montpellier forward Anthony Mounier pulled one back for the home side but Laurent Blanc's men held on. Now PSG are aiming to become the first team to win a Ligue 1, French Cup and French League Cup treble. They lifted the Coupe de la Ligue with a 4-0 win against Bastia last month and face second-tier Auxerre in the Coupe de France final on 30 May. PSG were without Zlatan Ibrahimovic, who missed the game with a calf injury, and in the Sweden striker's absence they were not quite at their fluent attacking best. In their previous four matches PSG had scored 17 goals with eye-catching wins over both Lille and Guingamp where they scored six goals. Blanc's side created plenty of chances but were only able to secure victory by a narrow advantage after Montpellier, who had the slim hope of securing a Europa League place before kick-off, pushed them right to the end. Matuidi, who said this week he does not want to leave PSG after being linked with a move to the English Premier League, opened the scoring in the 17th minute. He broke through the home side's defence and took a neat touch before he stroked the ball into the corner of the net. Lavezzi added a second with a crisp finish from Serge Aurier's low right-wing cross which beat the dive of Montpellier goalkeeper Jonathan Ligali. Mounier reduced the deficit five minutes before the break when he swung in a left-footed cross and the ball sailed over the head of Salvatore Sirigu in the PSG goal and into the net. Elsewhere, Lyon secured second spot after a 1-1 draw with Bordeaux, while the race for the third and final Champions League place will go down to the final weekend. Monaco are currently in third spot after a 2-0 win over Metz but should they slip up Marseille and St-Etienne are poised. Marseille were 4-0 winners over Lille while St-Etienne claimed a 2-0 success over Evian, who are now relegated to Ligue 2 along with Metz and Lens. Match ends, Montpellier 1, Paris Saint-Germain 2. Second Half ends, Montpellier 1, Paris Saint-Germain 2. Hand ball by Edinson Cavani (Paris Saint-Germain). Attempt missed. Edinson Cavani (Paris Saint-Germain) right footed shot from the right side of the box misses to the left. Assisted by Javier Pastore with a cross. Attempt missed. Bryan Dabo (Montpellier) right footed shot from outside the box is high and wide to the right. Assisted by Souleymane Camara. Delay in match (Paris Saint-Germain). Javier Pastore (Paris Saint-Germain) hits the bar with a left footed shot from the left side of the box. Assisted by Adrien Rabiot. Marquinhos (Paris Saint-Germain) is shown the yellow card for a bad foul. Foul by Marquinhos (Paris Saint-Germain). Jonas Martin (Montpellier) wins a free kick in the attacking half. Bryan Dabo (Montpellier) wins a free kick on the left wing. Attempt missed. Lucas Moura (Paris Saint-Germain) right footed shot from the centre of the box misses to the right. Assisted by Javier Pastore. Lucas Moura (Paris Saint-Germain) wins a free kick in the attacking half. Attempt blocked. Souleymane Camara (Montpellier) left footed shot from the right side of the box is blocked. Assisted by Paul Lasne with a cross. Corner, Paris Saint-Germain. Conceded by Hilton. Attempt blocked. Paul Lasne (Montpellier) left footed shot from outside the box is blocked. Assisted by Mathieu Deplagne. Adrien Rabiot (Paris Saint-Germain) wins a free kick in the defensive half. Foul by Lucas Barrios (Montpellier). Attempt saved. Serge Aurier (Paris Saint-Germain) right footed shot from the right side of the box is saved in the centre of the goal. Assisted by Lucas Moura. Corner, Montpellier. Conceded by Serge Aurier. Substitution, Montpellier. Souleymane Camara replaces Joris Marveaux. Substitution, Paris Saint-Germain. Marquinhos replaces Yohan Cabaye. Foul by Thiago Silva (Paris Saint-Germain). Jonas Martin (Montpellier) wins a free kick on the left wing. Serge Aurier (Paris Saint-Germain) wins a free kick in the defensive half. Corner, Montpellier. Conceded by Edinson Cavani. Corner, Montpellier. Conceded by Yohan Cabaye. Corner, Montpellier. Conceded by Thiago Silva. Substitution, Paris Saint-Germain. Lucas Moura replaces Ezequiel Lavezzi.